• See your materials and spaces through the eyes of someone experiencing aging vision conditions. • Encourage empathy for the vision struggles of the aging eye. 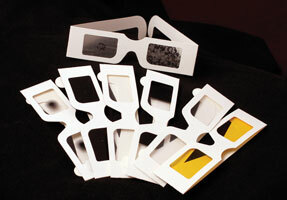 These cardboard and plastic framed* eyeglasses with plastic lenses simulate the vision conditions of: Combined Loss (CMV Retinitis/diabetic eye disease/immuno-suppressed vision loss); Central Field Loss (Macular Degeneration); Peripheral Field Loss (Glaucoma/Retinitis Pigmentosa); Overall Blur (Cataract/Cloudy Media); Hemifield Loss (Hemianopia/Stroke); Low Contrast (Normal aging vision issues); and Color Affectation (Cataract and lens aging). *Note: The manufacturer is gradually transitioning the eyeglass frames to an easier-to-clean translucent plastic material but while this transition in manufacturing is occurring, your kit may contain all cardboard frames or a mix of eyeglasses in cardboard and plastic frames. The eyeglass lenses have not changed and are still being made with the high quality plastic material of the original design. NOTE: VisualEyes™ Simulator Glasses are manufactured by a vision standards company that also designs eye acuity charts and other vision testing tools for the vision industry. Don't be misguided by other simulator glasses on the market that aren't designed to meet these standards! These glasses are endorsed by Lighthouse International, a world-renown organization dedicated to fighting vision loss for over 100 years. Want to know more? Go to these links at the New York Times to read stories about how the glasses have been used: “Simulating Age 85, With Lessons on Offering Care” by John Leland and “An Exercise in Empathy” by Jane Gross. *We regret that we are no longer able to offer the VisualEyes™ Simulators as individual glasses. We regret that we are no longer able to offer the VisualEyes™ Simulators as individual glasses. Shipping charges and tax (sales tax applies to MN residents only) are calculated and reviewable prior to your final check-out. Costs shown are in US Dollars (USD). Rush shipping is available at an additional cost. Please contact us for more details on rush shipping options. Elder Eye/Points Of View also accepts PayPal® worldwide purchases and ships internationally. 952-472-4155. Visa/MasterCard/Discover/American Express are accepted. No CODs. SHIPPING: Expect shipping to take 2-5 business days in the U.S., not including order processing. International orders typically take 5-10 working days, not including order processing. Order processing usually takes 4 to 24 hours. Quantity orders may take 7-10 business days to ship. If you need an item sooner, please contact us in advance of placing your order and we will do our best to accommodate your needs. DISCOUNTS: Quantity discounts are available for orders of 11 items or more. Contact us at 952-472-4155 or email your request, indicating the quantity requested, to Products@ElderEye.com and we will provide the discount we can offer for your order. When a discount applies, you can still place your order via the PayPal shopping cart. The cart will charge you for the items at the full price and, within 1 business day, we will refund your PayPal account for the corresponding discount. NOTE TO CUSTOMERS IN THE U.S.: If you are ordering over 25 sets, free standard shipping will also be applied to the above mentioned order refund. SPECIAL ORDERS: Purchase orders are accepted from educational and governmental agencies but NOT from customers outside of the U.S. and its territories. PO requests cannot be made via our PayPal ordering system so please call or email your order information. TAX EXEMPT ORGANIZATIONS: If you are a tax exempt organization residing in Minnesota and wish to claim a tax exempt status on your order, please place your order by phone at 952-472-4155. Click here for more about how to order, our return policy and other customer service policies.